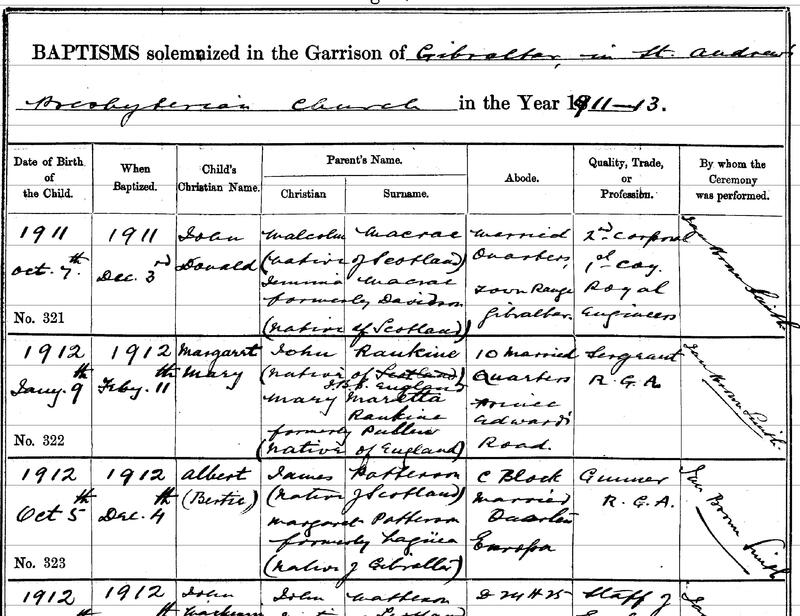 Discover your ancestors in these handwritten baptism records from the Scottish Presbyterian Church, St Andrew’s Church of Scotland in Gibraltar. The records include images of the original documents created over a century ago. Where the record is across two pages, use the next arrow to move to the next page. These parish registers are from the Scottish Presbyterian Church, St Andrew’s Church of Scotland, which was built in 1843. Many of the Scottish Regiments in Gibraltar had a Presbyterian Minister attached to them. No records exist of any civilian Minister being permanently in the Colony until the Rev. William Strauchan (a schoolmaster) commenced his work in January 1840 and continued for 9 years until December 1848. Prior to the building of the church, the Presbyterian congregation of Gibraltar worshipped in the Exchange Rooms of the Wesleyan chapel. Gibraltar is a small peninsula located on the Iberian coast, south of Spain. Its strategic position, at the entrance of the Mediterranean Sea, has given it great significance in European history. Its location was vital for the trade route from Europe to India. Whoever controlled Gibraltar could control what vessels entered or exited the Mediterranean Sea. The territory was ceded to the British from the Spanish after the Treaty of Utrecht in 1713. Through the next century it endured continuous sieges from the Spanish in attempts to regain the region. It was a major base for the British forces during the Peninsular Wars. Through the centuries, it has shown its strength as a military base during the Napoleonic wars and later during both world wars. After the Napoleonic Wars, the peninsula became home to a variety of immigrants. Genoese, Italians, Jews, Portuguese and of course Spanish and British all lived on the peninsula. Early in the 19th century outbreaks of yellow fever and cholera killed thousands. Sanitation and sewer systems was a concern. The town had small and crowded dwellings, which assisted the spread of disease. In 1865, a new Board of Sanitary Commissioners was established to create new drainage and better water supplies. Since the Treaty of Utrecht, Gibraltar has been under the responsibility of the British government. In 1965 and again in 2002, public referendums decided that the people of Gibraltar wanted to remain part of Britain rather than join Spain.